Monday, February 4th: Hot lunch, meatball or turkey sandwich; cardinal college: Zen Parenting in the Parish center from 7:15-8:45, hope to see you there! Tuesday, February 5th: Teacher appreciation Luncheon: rescheduled for this day, thank you! Wednesday, February 6th: Hot lunch, Pasta; PLEASE TURN IN 100TH DAY FOOD ITEM. Note in your child’s folder on Friday. Friday, FEBRUARY 8: Spirit Wear $1 dress down to support St. Jude. Our room parents are busy planning our valentine’s celebrations. Please be sure to see how you can help. A note about how we will celebrate Valentine’s Day will go home next week. We hope you stayed warm and enjoyed some quiet family time this week! Great time to read, play games, bake and just slow down the pace of life! Memories are made! We enjoyed reading through their “snow days” homework pages. It sounds like all the children had a nice time with their families! We had a short, but fun-filled Catholic School’s Week. We enjoyed PJ day, time with our 8th grade buddies, milk and cookies from Mr. Chinske and Mrs. Schaefer and we ended the week with our talent show and the red and white games! 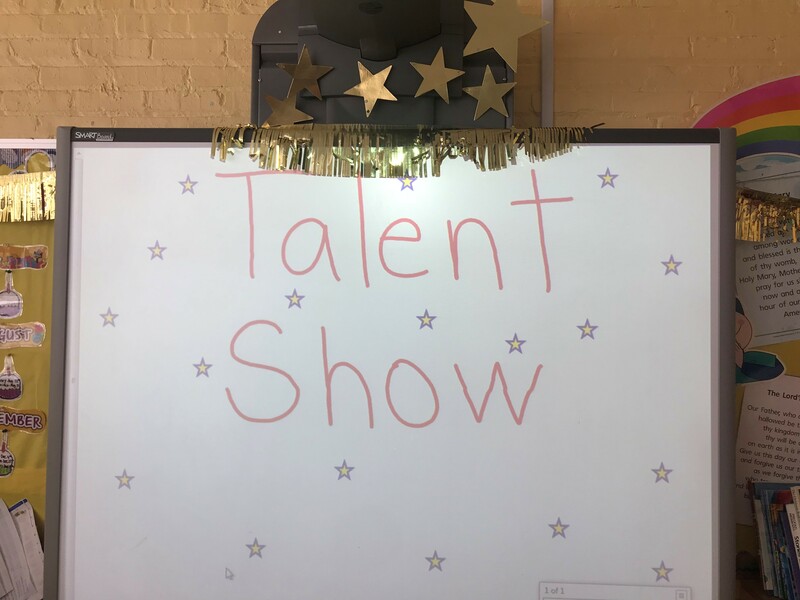 Please check out the pictures from our talent show HERE. What a talented bunch! We discover God’s world through our senses. We will explore our sense of touch. We are still working hard on sharing kindness with others. Each time a child is caught doing something kind, he/she puts a sticker on his/her mitten in the hallway! Next week we will be very busy preparing for our 100th day of school! Hard to believe it is here! Please make sure you read the note that was sent home on FRIDAY. It lists what your child should bring to school on WEDNESDAY for the 100th day celebration on THURSDAY. We will do many different math activities to celebrate 100 days of learning and fun in kindergarten. Sight words: continue to review our words; we will send a FEBRUARY/MARCH word wall home next week. Journal time is going very well! We put all our skills together to write and create these entries. Continue to discuss things as they happen so your child comes to school with his or her idea ready to go! We will be reading many books about the 100th day of school! Guided reading groups: we will continue to practice our reading strategies in small groups.